Mazda has entered the competitive compact SUV market with the CX-3. Tom Stewart reports. Say hello to the all-new CX-3, Mazda's baby SUV built to take on funky rivals like, in no particular order, the Fiat 500X, Nissan Juke, MINI Countryman, Vauxhall Mokka, Renault Captur, Peugeot 2008 Ford EcoSport and others. The CX-3 recently arrived in UK showrooms, and it's available with either front or all-wheel drive, a choice of one diesel and two petrol engines, manual or auto and five spec grades - SE, SE Nav, SE-L, SE-L Nav and Sport Nav - all of which amounts to 18 different variants in nine different colours with prices starting at £17,595 rising to £24,695 on the road. First impressions count for a lot, and mine was that the CX-3 is a pretty little thing. I guess it's likely to appeal more to girls than boys, and probably more to the young than the old. But demographics aside, it's unashamedly trendy in appearance but nonetheless an attractively styled car, and from that starting point its cute looks grew on me. The diesel is a 105hp, 1.5-litre 4-cyl engine, and that comes with either FWD or AWD with a 6-speed manual, or if AWD then with either manual or auto 6-sp transmissions. On the launch I drove an AWD diesel manual and soon realized that if decent progress is to be made then the gearstick comes in handy. 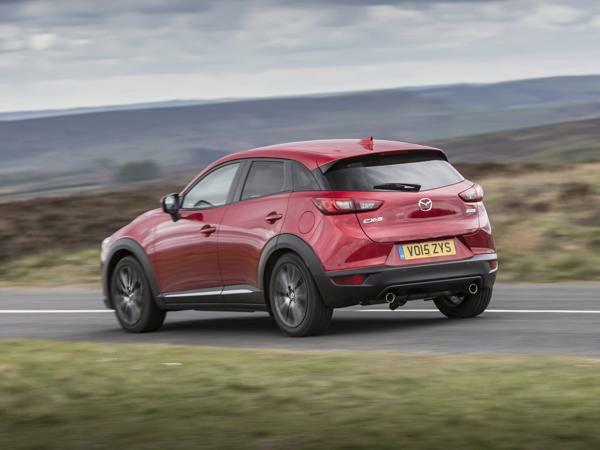 Although its 270Nm torque figure is respectable, and 66Nm up on both the CX-3 petrol variants, the diesel needs some goading if you're a boy or girl with places to go and things to do. Apart from that the CX-3 is a gem to drive. The gearchange action is oh so easy, as is the clutch, while the steering is not too light, not too heavy and feels, well, spot on. The chassis is taut and sturdy with suspension that absorbs rough moorland B-road bumps while still delivering an impressively comfy ride. Other CX-3 engines are a 2-litre petrol with either 120 or 150PS. The latter (6-speed manual only) is a noticeably more willing performer than the diesel with 0-62 in a claimed 8.7secs and a 124mph top speed, but you don't have to give this petrol motor the full beans to feel the performance improvement as it's quite apparent in normal driving. Combined fuel consumption and CO2 for the two variants I drove are 60.1mpg with 123g/km for the 105hp diesel AWD manual, and 44.1mpg with 150g/km for the 150hp petrol AWD manual. Those seeking maximum economy should opt for the front-wheel-drive manual diesel with its 70.6mpg and 105g/km emissions. So, the CX-3 is a doddle to drive, and the experience is further enhanced by a contemporarily-designed, attractive, well finished, well-equipped and indeed comfortable interior. There's ample room in the front in all directions, along with comfy and supportive seats, and there's adequate space for two adults in the rear, although rear seat headroom is borderline for tall folk. Bootspace is rated at 350 litres in 5-seat mode or 1,260 litres with the 60:40-spilt rear seats folded. In practice this means that, with all seats in use, two items of airline cabin baggage pretty much fill the boot. The CX-3 may be an SUV, but it's a baby SUV so loadspace isn't much better than a Fiesta's or Clio's. On the upside, the CX-3's SUV proportions afford it a higher seating position, which make ingress and egress very easy, so my earlier supposition that it'll appeal more to the young than the old may not hold true. All spec grades feature a 7-inch touchscreen, DAB radio and Bluetooth connectivity as standard. Both the CX-3s I drive were in the very well-equipped Sport Nav spec which comes with all manner of goodies including tasty machined alloy wheels, adaptive LED headlamps and LED rear lights, a reversing camera and much more. 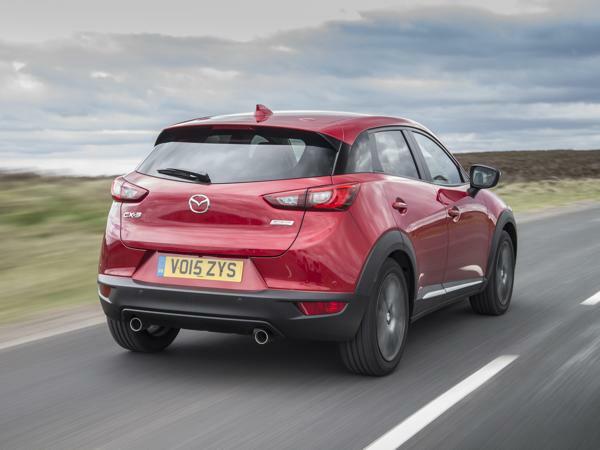 As the Sport Nav name suggests, it also comes with Mazda's new navigation system with free Euro map updates for three years plus a Bose audio system and a very convenient head-up display. However, buyers should note that the nav system's designers are plainly unaware of the meaning or even the existence of the word 'intuition'. Having also recently driven a new Mazda3 and the latest Mazda6 in Sport Nav spec, I can report that navigating the navigation system tested my patience to the limit, and beyond, in all three cars. Yes, if I owned them I'd (probably) get the hang of it over time, and the system's functionality is indeed useful for the audio, phone, online and other purposes, but, in terms of satnav operation, give me a simple, inexpensive and intuitive TomTom or Garmin any day. To summarise, the new CX-3 looks great, it oozes quality, it's comfy and it rides and drives very well. I've not driven all its rivals, but were it my money it'd be a toss-up between the Fiat 500X and this Mazda, minus the confounded satnav.